If you ever ask the toddler what he wants to do he’ll answer painting. He absolutely loves sticking paper to the table, choosing a pot of paint and being creative. Hand print and thumb print animals are his current obsession so what better than hand print Easter bunnies for Easter gifts? First of all stick your paper to the table, we use washi tape, to ensure the corners stay down. 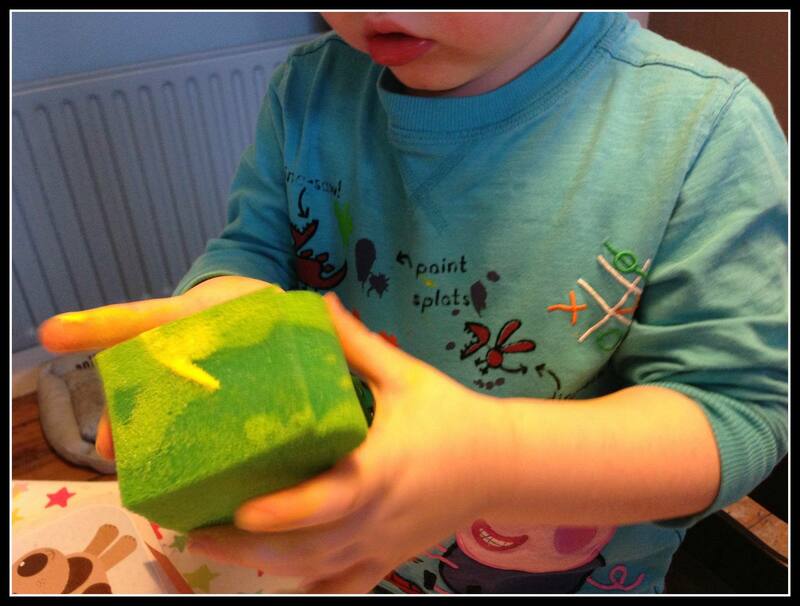 Choose which hand you want to use and sponge paint over the palm and fingers. Carefully press down the palm of the hand and the index and ring finger only, keep the other fingers off the paper! 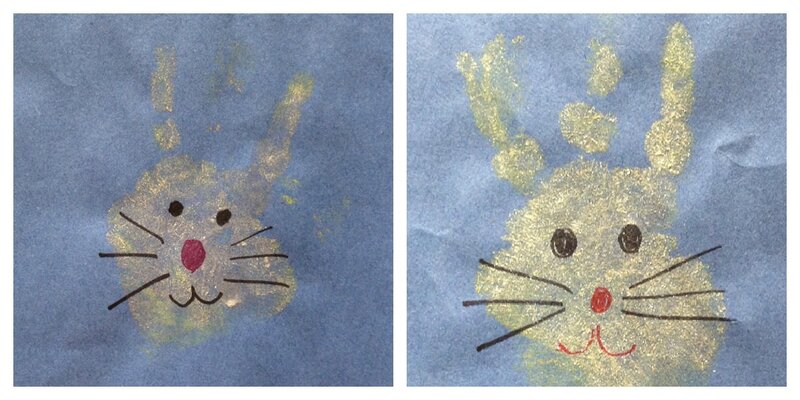 Carefully take your hand away from the paper and you will be left with the outline of a bunny. Leave to dry, then add features such as the eyes, nose and mouth. 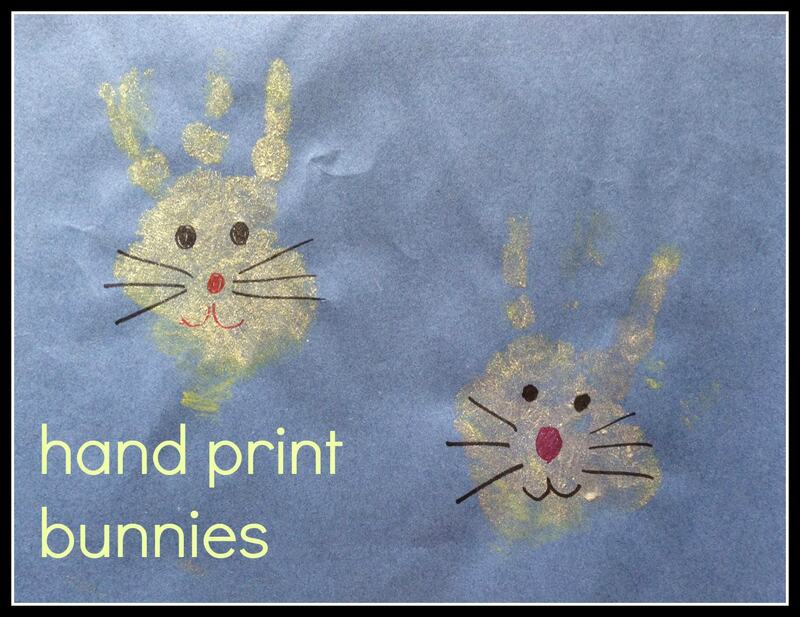 Cute hand print bunnies which will make great cards for Easter. I’d love to try this, just not sure we will be able to stop all the fingers going on the paper, but definitely worth a go! Oooooh I was just asked to do the easter craft with 25 loud 8-10 year olds, maximum time 15 minutes AND no baskets please! i Didn’t have a clue what to do. Now we are so totally set, I cant wait! This is brilliant, it can be done in bulk with minimum prep!! thank you soooo much! PS keep the unwanted fingers out of the way by placing a pencil underneath them!